Free Adult Swim Lessons a Big Success! The Friends of Los Banos sponsored a Spring session of Adult Swim Lessons. Fourteen adults completed the course. Another session will begin in the Fall after the busy summer season at Los Banos. Thank you members! Everyone needs to know how to swim. 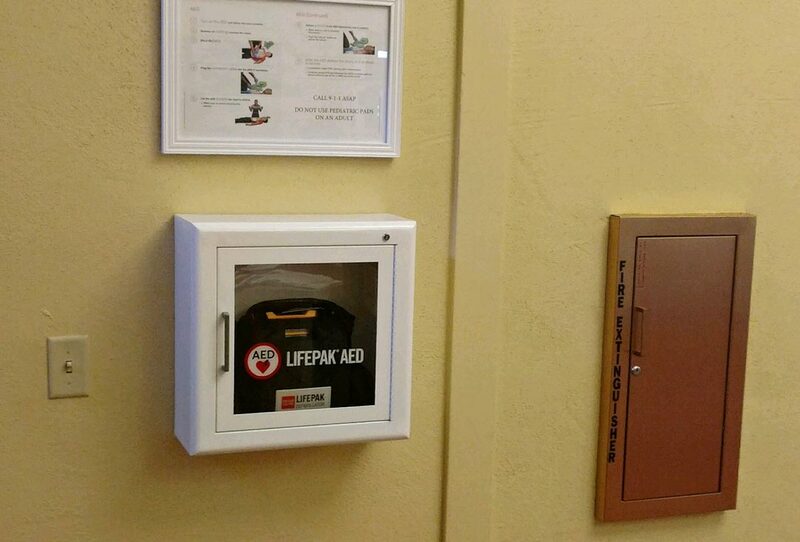 By Sam Goldman, Noozhawk Staff Writer | @Sam__Goldman | April 20, 2017 | 8:35 p.m.
Adhering to the principle that one can never be too safe, Santa Barbara has installed emergency defibrillators at five of its recreation facilities. The devices were originally ordered by the Santa Barbara City Fire Department to install in each of its engines. Surplus automated external defibrillators were handed over to the Parks and Recreation Department and placed in five of its facilities that see a high amount of physical and sports activity. “We are extremely excited to have these units, and although we do not have a high frequency of cardiac emergencies, we do serve a broad population, and you can never be too prepared,” assistant Parks and Recreation director Rich Hanna told Noozhawk. The portable devices are used when a person goes into cardiac arrest. After evaluating a person’s heart rhythm, the devices get the heart beating again by sending it an electric shock through two pads stuck onto the person’s chest. The sites with AEDs include the Cabrillo Pavilion Bathhouse at 1118 E. Cabrillo Blvd., the Carrillo Recreation Center at 100 E. Carrillo St., Los Baños del Mar Pool at 401 Shoreline Dr., the Santa Barbara Golf Club’s Mulligan’s Café at 3500 McCaw Ave., and a lifeguard vehicle based at East Beach. Hanna said that in the past five years, Parks and Recreation Department facilities have experienced three cardiac emergencies: one each at Los Baños del Mar Pool, the golf course and the Carrillo Recreation Center. According to the American Heart Association, more than 90 percent of people who experience sudden cardiac arrest die, typically within minutes, which makes an AED an incredibly valuable tool. The chance of survival doubles with the immediate use of an AED and CPR. Though each of the five facilities will have trained staff who Hanna said “should definitely be involved in administering patient care,” anyone available during an emergency can remove and unpack an AED from its wall mount and follow the device’s instructions. Scroll down for the instructional video city staff used for the LIFEPAK kits. — Noozhawk staff writer Sam Goldman can be reached at sgoldman@noozhawk.com . Follow Noozhawk on Twitter: @noozhawk, @NoozhawkNews and @NoozhawkBiz. Connect with Noozhawk on Facebook. Mary Turley, individual Friends of Los Banos sponsor, netted over $350 for "Adult Learn to Swim" classes this January. Her handmade shower bags were a big hit and sold out within a few days. Thank you, Mary, for your wonderful contribution to the pool and our community! I wanted to follow up with you about the Free Adult learn to swim lessons. First, the City would like to Thank the Friends of Los Baños for helping to make this program possible. We had 10 participants sign up very quickly once I sent out my newsletter with the course details. In addition, there were eight people on the waiting list, which indicates a need for this class in our community. For this reason, I believe that we can run a successful class again. I created a survey to see if people found the class beneficial and 100 % of respondents reported that the course was helpful and that they are more comfortable in the water. 100 % of respondents also indicated that the instructor and lifeguard were both very professional and made them feel safe. Lastly, 100 % of respondents suggest that we offer this course again. We are very fortunate to have a fantastic staff that made this program possible and they all reported that they enjoyed teaching the course and that they hope we can offer it again. Based on feedback that we received, I would like to offer the course again with a few changes. I would like to have two instructors in the water, and one LG on tower and I would like to offer the course for six weeks versus eight because eight weeks is a big commitment. If the Friends of Los Baños Pool are interested in funding this program again, the staffing cost would be $600 with my proposed changes, and we would offer the course in the Spring of 2017. “This class was very beneficial! It was a great environment with a few people, amazing and patient instructors! Shop at AmazonSmile and 0.5% of your purchase will be donated to Friends of Los Baños del Mar Pool. It is very easy! Go toorg.amazon.comand select "Friends of Los Banos" as your charity! New Swim Caps Have Arrived! Iconic Friends of Los Banos Del Mar swim caps have arrived! Need a new cap or an extra as a back-up? Latex caps in yellow, navy, pink, black are $4.00 each. Silicon caps in yellow, royal blue are $10.00 each. Call or text Rusty at (805) 698-1382. To ALL the friends of the pool I want to say THANK YOU for making my job of membership coordinator a rewarding experience. I truly appreciated every positive result to my “sales talks” and mailings about the good cause, and I especially valued your enthusiastic and generous support year after year. Roughly 50% of the membership has noticed a change in the renewal requests. It was time to bring the process up to modern business practices. Not being an IT-savvy octogenarian, I was happy to pass the honor of being the steward of your contributions to Gail Ward. Gail has a long-time association with Los Banos, her husband having served on the board of directors during the nineteen-nineties. I trust you all will extend your good will and show Gail the same loyalty as I have enjoyed. Working together we will create a pleasant environment at our beloved city landmark and pay forward our good fortune. Friends of Los Banos you are fabulous. Keep up the good work! I hope to be part of it in one way or other for a while yet. This is a good spot to add personal stories about the pool or other tidbits for fellow members. Do you have a favorite swim drill or workout you would like to share? Great deal on swim gear? ?